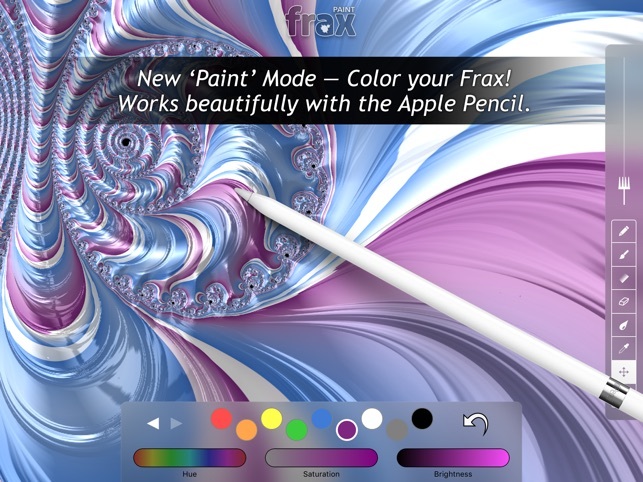 Frax is an art program that puts the “equations of nature” in the palm of your hand. 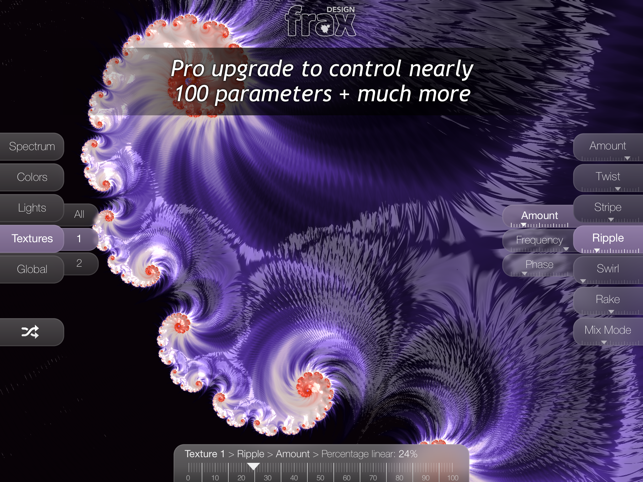 Frax is powered by fractal geometry, the same principle that creates patterns of self-similarity in our natural world. From spiral galaxies to hurricanes, from tree limbs to branching blood vessels, the universe is filled with endless variation and staggering beauty. 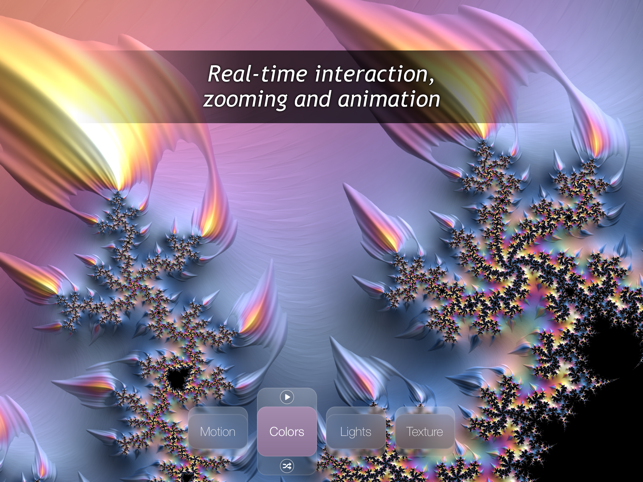 Frax visualizes this natural geometric code, so you can explore vast animating digital landscapes and make a masterpiece on your touchscreen. Zoom deep into your creations. 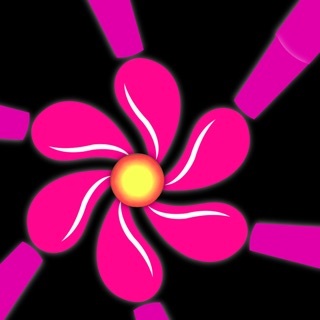 Use multi-touch gestures to fly through and explore intricate shapes and patterns. 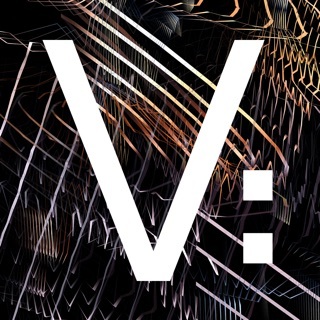 Tilt-to-steer through animating digital worlds, as you challenge yourself to chart a course for a long and beautiful flight –all at a depth range of a trillion-to-one. Unleash your inner artist with complex color gradients to smoothly tint and shade your fractal shapes, two light sources for glossy reflections, and novel textures. The combinations are endless: supersmooth or wildly chaotic, metallic sheen or pearly white, subtle shades, stark monochrome or screaming supergloss. Or upgrade to Pro to access almost 100 parameters and controls! Then share your creations with your friends via Facebook, Twitter and text. Or invite other users to step into your animating world by sharing a live preset link. You can render high-quality images to your photo library or create ultra-high quality 200 Megapixel renders with an IAP. And for the first time, you can now record VIDEO of your Frax animations directly within the app! (Pro IAP required.) Our users have put their designs on canvas, posters, scarves, T-shirts and textiles. The creative possibilities are endless! What will Frax inspire in you? 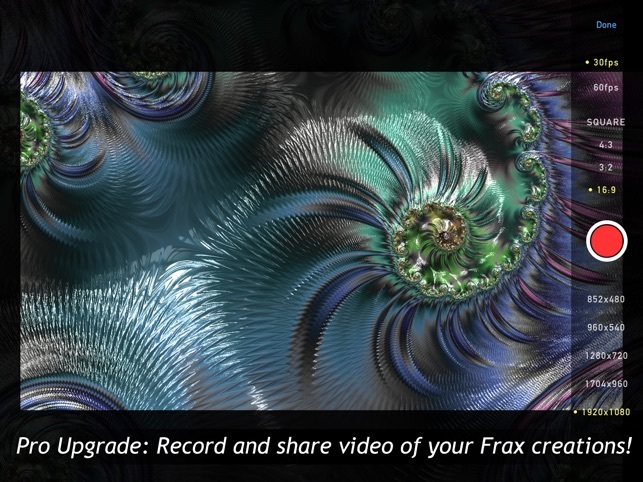 We hope you enjoy Frax! 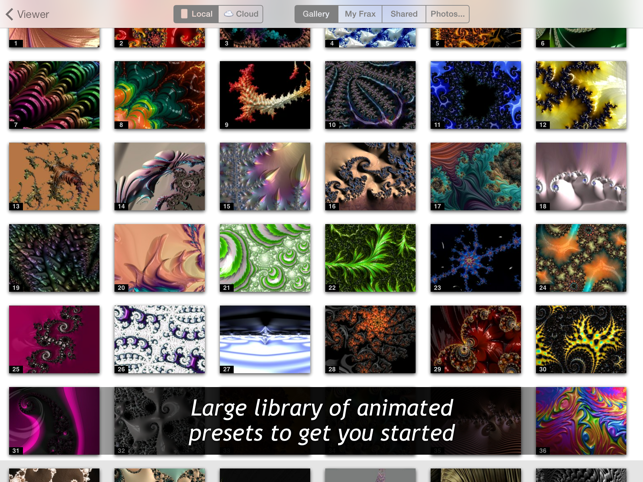 - Compatibility with new iPad Pro 11" and 12.9"
I started out enjoying exploring the different fractals. Then recently I needed a better background for PowerPoint. This was a great tool to create a background with depth and character but boring enough to be in the background. 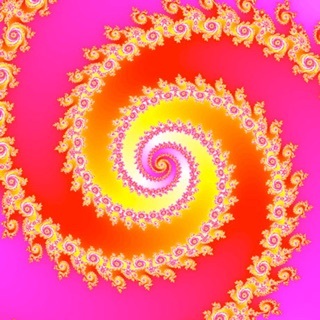 I focused on what normally would be a boring part of the fractal. I know this is somewhat an unintended use for this but I was able to use this as a tool rather than just zooming through cool scenery. 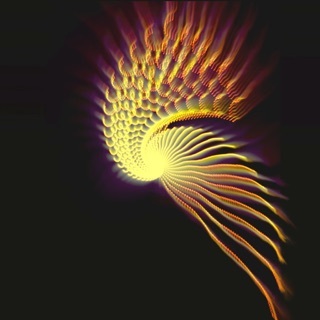 I’ve been trying to teach myself fractals with a PC program for years and have never been able to figure out how to get the beautiful images I often see. I am so, so, so thrilled with Frax. It makes exploring and seeing results very very easy (imo) and it is just so beautiful to look at!!! You have one very VERY happy customer for life! 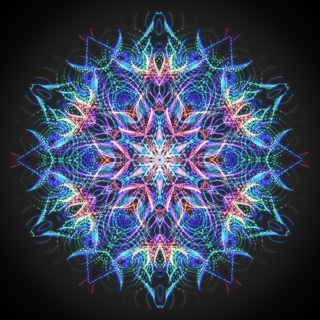 Wonderful app that makes exploring and creating fractal imagery really fun and enjoyable. The UI makes it fun and yet still offers lots of control. Brings me back to the days of the KPT plugins!